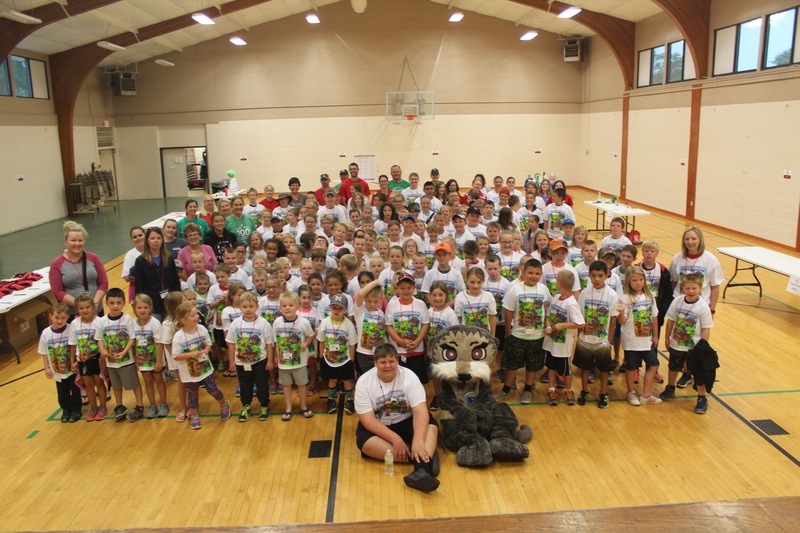 On Tuesday, June 6th, 127 children, kindergarten to sixth grade, with forty volunteers arrived at the Cairo Community Center for the Third Annual Cairo Safety Day, sponsored by Progressive Agriculture Foundation. This year’s safety day was theme was Safe Summer Fun, focusing on water safety. A team from Farm Credit Services of America taught children how to make life savers out of plastic jugs and rope. The volunteers taught children how to throw these devices into the water and drag someone struggling in the water back to safety. Tiffany Jacobsen taught children about life jackets by dropping an orange in a bucket of water to float, then removing the peel and watching it sink. Josh the Otter was on site teaching children never to go near water without an adult. The suit and materials were developed by the Joshua Collingsworth Memorial Foundation www.joshtheotter.com. Each child went home with a goodie bag filled with items from the presenters. Each child received a t-shirt from Progressive Agriculture Foundation, Josh the Otter books sponsored by Pathway Bank, and a life jacket provided with discounts from Cabela’s and donations from Cargill. Other training included Sugar in Your Drink by Central Nebraska Health Agency, Home Alone training by the Hall County Sheriff’s Department, Chemical Safety taught by Patty Camp of Cargill, ATV and side by side safety by Greenline, hearing and sun safety presented by Hall County Extension sponsored by UNMC, Weather Safety by Regina Bird with NTV News and Railroad safety training by BNSF. The day concluded with a demonstration by Titan Machinery. The demonstration showed children how fast a Power Take Off shaft could grab loose clothing and cause major injury or death. This event is developed by Safety Day coordinators Tara Janda, Sarah Quandt and Charity Adams. The committee attends annual Safety Day training provided by Progressive Agriculture Foundation. Plans are already underway for next year’s Safety Day on June 5, 2018. A fund has been set up at the Cairo Community Foundation to receive tax deductible donations to continue this program in Cairo.